At Clearwater we provide a friendly, professional domestic and commercial window cleaning service covering Airdrie, Coatbridge, Chapelhall, Calderbank and all surrounding areas. We are a fully licensed and insured company registered with North Lanarkshire Council and we guarantee excellent results using the latest technology in cleaning equipment. Our window cleaning incorporates the use of a water-fed pole system to clean your glass, frames, sills and doors as standard. 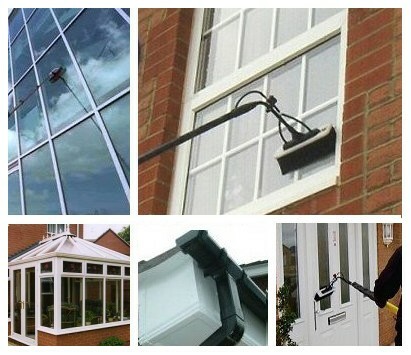 However, additional cleaning of surrounds, conservatories, gutters and fascias is available upon request on an individual quote basis and a detailed list of additional services can be found on our services page. Our window cleaning services can be tailored to your requirements on a fortnightly or monthly basis and all additional work will be undertaken subject to your request.